While adventure stories were originally written for boys, domestic dramas were written for girls. Adventure stories are linear. The hero starts the story by leaving. He often finds himself in a new home after completing his journey. This is a linear plot. In contrast, domestic dramas are circular. Domestic stories are home-away-home stories, with the implication that a girl’s proper place (indeed, only place) is in the home. The chapters of domestic stories tend to be episodic rather than suspenseful, a la Anne of Green Gables, in which a number of the scenes could be switched around and it wouldn’t really matter to the timeline of the plot. Domestic dramas emphasise the seasons, since seasons are themselves cyclical and therefore circular. For more on the major plot shapes in children’s literature see this post. Even today, stories thought to be more popular with men tend to feature stronger narrative drive. Breaking Bad, for instance, has recently been a very popular fictional work among men and women alike, and its heroes are men. But the women of Breaking Bad exist mainly as wifely opponents, with the addition of a non-wife female role only in the final season (Lydia). Breaking Bad has episodic elements to it — each episode features a different self-contained plot such as a factory heist to steal a drum full of chemicals, or a visit to the guy with the gold tooth to blow up his lair. At the end of each of these episodes, Walter White returns to his home. As the series progresses it becomes more and more linear. Walter White does not end up back in the home. We might compare and contrast Orange Is The New Black for a modern television drama starring women, ‘for’ women. This is a far more episodic show. Though there is a linear narrative holding the scenes together, the audience derives pleasure not from intense curiosity about what’s about to happen next, but in enjoying the moment — the humour and the dialogue of each scene. There are of course genre differences between Breaking Bad and Orange is the New Black, but it’s no coincidence that one stars men and the other stars women; there is a long history of just this sort of gender division in our popular fiction. The Wide, Wide World by Elizabeth Wetherell — a sentimental, religious story. A girl is sent to live with a country aunt after her mother is sent away to die. The works of Miss Charlotte M. Yonge — a very ‘Victorian’ woman, believing in the inferiority of females. She edited a magazine for girls called The Monthly Packet for more than 40 years. (See it online.) Considering her works are now out of print and seldom read, she was very popular in her time. She wrote The Daisy Chain, which is an important forerunner to Little Women. Little Women by Louisa May Alcott — the first two books in this series have been an enduring success. As well as sermonising, the stories feature human reaction against sermonising, which is probably part of their longevity. The character of Laurie is probably a precursor to the likes of Edward Cullen — not entirely fleshed out as a male character, but filling girlhood dreams of boys at a certain developmental stage. This series set the tone for many girls’ books to follow. 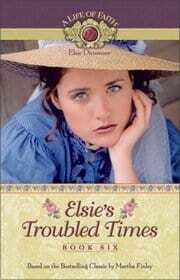 Elsie Dinsmore by Martha Finlay — a series about a tearful eight-year-old who is an extreme goody-goody. Modern cover model looks a lot like Elaine Benes to me, though I doubt there are many similarities. What Katy Did by Susan Coolidge — starts off active and ‘feisty’ but ends up married to a handsome naval officer as the series continues. The Gypsy Series by Elizabeth Stuart Phelps — the heroine Gypsy Breynton is an appealing and sporty main character, but there’s no realistic place for her one she is past adolescence, so she ends up supporting her brother as he goes off to Yale. Three Vassar Girls Abroad — the first story to feature young women at university, as was happening in the real world with the admission of women to Vassar College and other women’s colleges in America. The Five Little Peppers and How They Grew by Margaret Sidney — notable for being the first story about genuinely poor people rather than just ‘hard up’. Seven Little Australians by Ethel Turner — the first notable Australian story of this kind, starring model children, though it reads as quite English, since the father was English. Anne of Green Gables by L.M. Montgomery — Anne exemplifies the ‘Ugly Duckling’ plot, not present in Rebecca of Sunnybrook Farm. Later books in the series have been described as ‘sentimentally dishonest’. Jackanapes by Mrs. Ewing — a later Victorian work. A low-tension story about a boy and his growth into manhood with a war setting. The Cuckoo Clock by Mrs Molesworth — Griselda goes to live with her two old-maid aunts in an old-fashioned house. She gets bored and enters into a fantasy world with a real-life friend who has come to live nearby. Little Lord Fauntleroy by Frances Hodgson Burnett — similar to Mrs Ewing and Mrs Molesworth but by a much more powerful writer. This book is described as ‘namby pamby’ but the main character isn’t all that odious, apparently, if you read the story. Instead, he is likeable and unaffected and has left-wing politics for his class. The moral is that the only true nobility is within oneself. A Little Princess is like Fauntleroy but in reverse — a story about a girl who goes from aristocracy to the street. The moral is exactly the same. The Secret Garden was written 20 years after Burnett’s first, and is a lot more complex. Mary Lennox has to struggle before achieving a heroine’s status, whereas for the other two main characters it came naturally. The Secret Garden does not espouse Victorian values, in which children should be seen and not heard and do as they’re told. Instead, the book encourages self-reliance and cooperation, which may explain its enduring appeal. The function of domestic dramas was to teach girls that a home life is a glamorous one, and to give them a glimpse of life outside the home, presumably so they’d be happy to stay inside the home. But looking closely at these stories, they weren’t really about promoting how wonderful it was to scrub and cook and look after babies — the absolute ideal has always been that these tasks are done by ‘some other woman’ rather than the heroine. There’s no doubt that most reading girls would have been reading adventure stories too, especially if they had brothers. Unfortunately for them, they never got to see themselves in those stories, except as annoying mothers who needed to be broken away from. The more successful domestic dramas were less pious and had more action, which shows what girl readers really wanted, despite what was thought to be good for them. 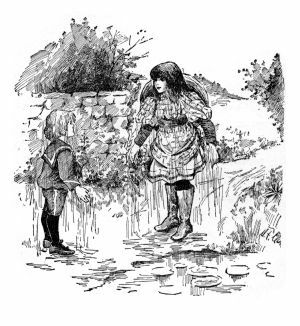 For example, the character of Nancy (a friend to the heroine) made The Wide, Wide World successful because she was a bit of a tearaway, and Gerty of The Lamplighter was also a wild child. “Domestic” does not necessarily mean “bliss” in a children’s book. From the mid 20th Century authors didn’t shy away from portraying threats to young characters’ well-being. But even earlier than that, intimacy didn’t equal peace. Domesticity has always been considered an unstable state. The word itself has meant different things in different eras (think of today’s common usage, as police terminology). It has gone from ideal to pejorative.